The purpose of the preliminary engineering and environmental work being completed for the Eastern Corridor Program is to evaluate the Program’s impacts to the man-made and natural environment, as required under the 1969 National Environmental Policy Act (NEPA). At the start of the evaluation process, it was agreed amongst the federal and state resource agencies that a tiered Environmental Impact Statement (EIS) approach would be used to address the complex issues of the Eastern Corridor. A Tier 1 EIS would address the range of actions within the full multi-modal plan and provide a conservative assessment of impacts related to decision-making under NEPA. Then, separate Tier 2 NEPA documents, which examines the projects and their impacts in much deeper detail, will be prepared (and descisions made) for each of the core Eastern Corridor projects, consistent with the template established under the Tier 1 EIS. This tiered EIS study approach allows issues “ready for decision-making” to be effectively considered at the appropriate project development juncture. The nature of the tiered approach also allows the public to have a conversational role in project development and to effectively contribute to the decision-making process. 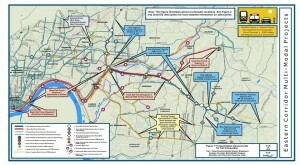 Completed in 2006, the Tier 1 work evaluated the physical and operational aspects of the multi-modal improvements identified in the Eastern Corridor Major Investment Study (MIS), as well as performance relationships between the different transportation modes. A broad range of transportation improvements was considered in order to understand and describe the ability of the different modes to meet the identified transportation needs. At the end of Tier 1, a set of multi-modal improvements was recommended for further evaluation. The improvements included new roadway capacity enhancements, new rail transit, expanded bus transit, improvements to the local transportation network and accommodations for bicyclists and pedestrians. More detailed information about the Tier 1 alternatives evaluation and recommendations can be found in the Eastern Corridor Tier 1 Draft EIS and Tier 1 Final EIS. 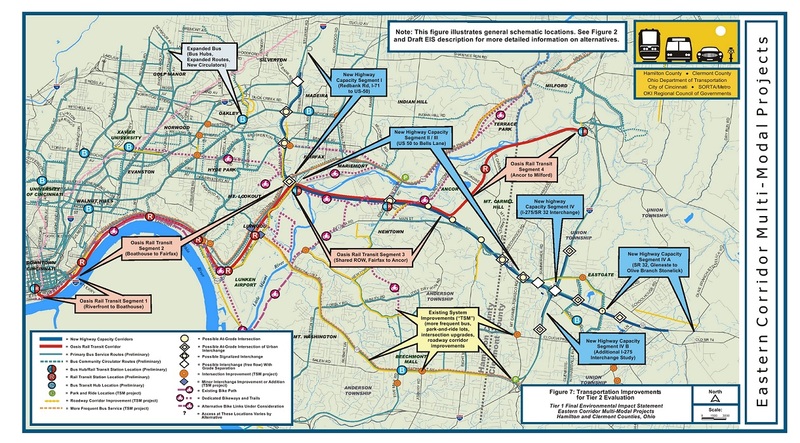 Tier 2 work for the Eastern Corridor involves further analysis and development of the Program’s four core projects: Red Bank Corridor (Segment I); Red Bank to I-275/SR 32 (Segment II and III); Eastgate Area to Batavia (Segment IV and IVa); and Oasis Rail Transit. Recommendations made in Tier 1 are being examined in much more detail and evaluated for impact, function, context, constructability and affordability. Preliminary alternatives will be narrowed and refined, and the study will conclude by identifying preferred alternatives for the four projects to eventually undergo detailed design and construction. Click here for additional information about current Tier 2 study efforts.